A group of friends went to dinner in an early celebration of Mother’s Day. They hired baby-sitters for their children; they coordinated a carpool to a city an hour’s drive north, where they had made reservations at Communal, a restaurant that boasts locally sourced, seasonal menus. At Communal, they ordered wine, appetizers, and six entrees, which they shared, family-style, in an amber-lit, partitioned room. Some partook of dessert, which was also shared. The friends split the bill without quibbling, and tipped their servers well. One of the men offered to drive everyone home. Hunger sated, spirits buoyed, they returned. I was fortunate to be part of this dining experience. My friends and I live in a rural area with limited dining options, so planned events – I call them food pilgrimages – provide us with rare moments of socio-culinary joy. The details of this meal have since faded into an overall impression: the food was delicious; we had a great time. But one dish stood out: skirt steak with roasted piquillo peppers. I could not stop thinking about the steak the following day and well into the evening, so I called the restaurant about twenty minutes before they closed. To my delight, one of the chefs agreed to talk with me. I apologized for the late hour and asked if he had a couple of moments. He assured me that he did, then he told me how the dish was made: ingredients, pointers, and all. Dear chef, had you been standing next to me, I would have kissed you. My friends, Casey and Laura, occasionally abduct me for a girls’ night out. Recently, we ventured to Chef’s Table, which is located in Orem. Chef’s Table is an eight-year recipient of the Best of State Award in Fine Dining. The restaurant is a luxury that we, on school salaries, can afford only on choice occasions, so we tend to make the most of them. When we arrived, they seated us in the east room, which has floor to ceiling windows overlooking Provo Canyon. The setting sun blushed against the grey, striated upper crags of the Wasatch front, shrouding the lower valley in evening shade. We nestled into comfortable leather chairs amidst the tinkle of forks and low conversations. A change rippled through the dining room sometime in between the second round of rolls and the uncorking of the wine. The room quieted. Other diners, mostly couples, were watching us as we sampled from each other’s plates: spoons swooping, glasses tippling, murmuring in a near-rapturous state. It occurred to us that three boisterous women, high on delicious food and wine, might pose a date night anomaly. Glancing mischievously at one another, our eyes made a silent pact to provide our fellow diners with the entertainment they sought. Unapologetic foodies, we murmured louder. By the time our entrees arrived, we didn’t really care what the couple seated across from us – who ate their entire meal one-handed, their opposite hands entwined in a sustained, tabletop embrace – thought. I turned my back to the balding man among the party of six in the corner of the room. He had actually leaned forward in his seat, neck craned, ear cocked in our direction. Casey playfully returned the favor. “Maybe we should invite him to join us,” she mock-whispered. Our servers offered us countless rolls and unending butter; they refilled our glasses, removed plates, replaced silverware, and inquired about our satisfaction with each dish. I think our antics secretly amused them, though the befuddled hostess may have lamented her placement choice. Perhaps we’ll warn her next time: Beware! Foodies Gone Wild! On that night, however, our fleeting celebrity was well worth the cost of the performance. Joe, the chef de cuisine at the school where I work, rides a motorcycle and rocks out in a band. He recently got his last name tattooed on his forearm in large cursive letters, and is someone to whom I might turn if I needed food advice, special ingredients, or, perhaps, the name of a hit man. Chef Joe is one of the most generous people I know. On my daughter’s birthday, he posted a big colorful sign in the cafeteria. He offers food samples and overages he can’t use to anyone who will take them. He’s given me honeycomb and Thai peanut marinade; he’s even given me duplicate cooking books, because he knows I share his love of food and because he has excellent taste in aspiring food writers who live in his immediate vicinity. Generosity isn’t an air or obligation for him; it’s his manner of being. I can attest to Joe’s generosity specifically, but in my experience many food people share this quality. 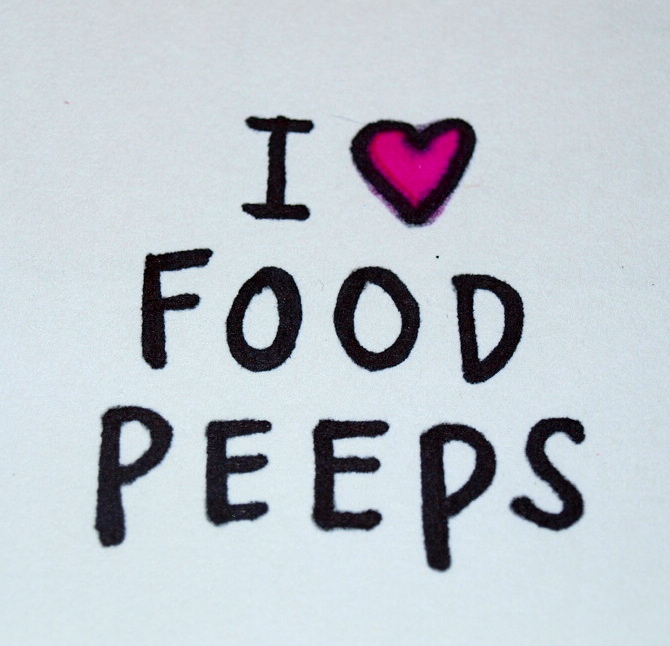 I do, as do my food-loving friends. I have yet to meet an ungracious chef. Generosity of spirit marks those who love to share their meals: it compels us to commune, to inquire, to enjoy and delight. Our spirits are propelled by the appreciative gestures and smiles of our efforts. It makes Joe happy to make others happy. It makes me happy to make you happy. 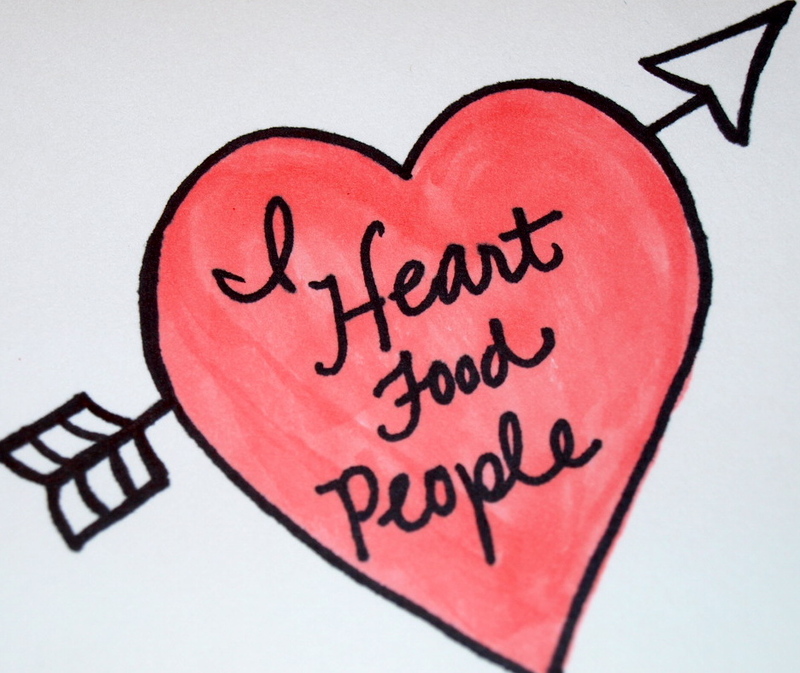 To all my friends in food: Thank you for helping to make the world a happier and infinitely more delicious place. Thank you for giving me direction and literary purpose. Happy, happy Thanksgiving!